Tephilah Nechonah [prayers for the entire year]. According to the custom of the German and Polish Jews. Arranged in accordance with the daily prayer book of Shabbetai Sofer ben Isaac of Przemysl. Hebrew and English on facing pages. Published for the benefit of the Jews’ Free School. 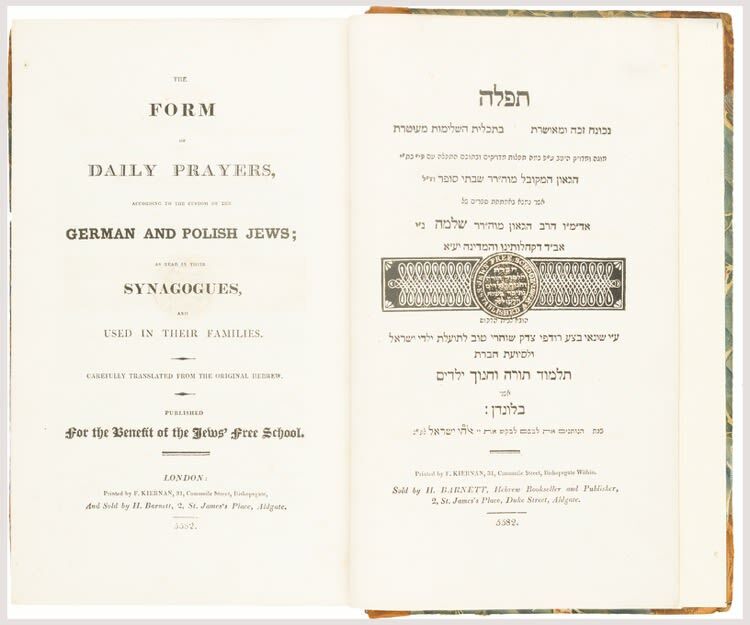 R. Shabbthai Sofer was commissioned by the Rabbis of the Council of Three Lands to publish an accurate edition of the Prayer-book, which he did with much reference to the now lost Siddur of Solomon Luria. It was partially published in 1617 in Prague and recently a complete edition was issued in three volumes in Jerusalem from the original manuscript which was in the library of Chief Rabbi Solomon Hirschel and subsequently in the Library of the London Beth Din (since sold).